On October 27 from 5 p.m.-midnight, the Town of Cary will close Chatham Street from Academy Street to The Cary Theater entrance at 122 E. Chatham St. to accommodate Cary’s Zombiepalooza. Visitors to downtown Cary will have access to The Cary Theater parking lot and downtown businesses located within the closed area. 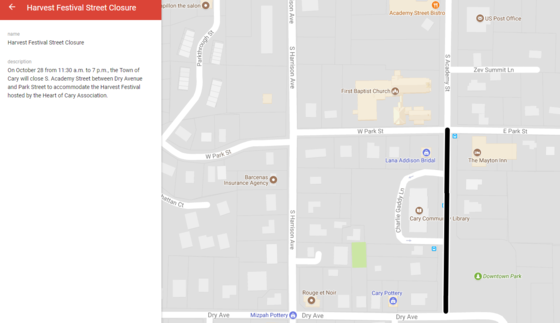 On October 28 from 11:30 a.m. to 7 p.m., the Town of Cary will close S. Academy Street between Dry Avenue and Park Street to accommodate the Harvest Festival hosted by the Heart of Cary Association. On October 27 from 5 p.m.-midnight, the Town of Cary will close Chatham Street from Academy Street to the Cary Theater entrance at 122 E. Chatham St. The closure is necessary to accommodate Cary’s Zombiepalooza, an outdoor screening of 14 short films from the Make Your Own Zombie Film competition; a costume contest; film awards; and Dawn of the Dead screening. Visitors to downtown Cary will have access to The Cary Theater parking lot and downtown businesses located within the closed area. On October 28 from 11:30 a.m. to 7 p.m., the Town of Cary will close S. Academy Street between Dry Avenue and Park Street to accommodate the Harvest Festival hosted by the Heart of Cary Association. The event will be held along Academy and West Chatham streets from 2-6 p.m.
Family-friendly activities at the Harvest Festival include trick-or-treating at local businesses, a petting zoo, bounce house, local musicians, pumpkin carving, cookie decorating, and face painting. The festival will also host a variety of street vendors, featuring local arts and crafts, food trucks, and a beer and wine garden. The Heart of Cary Association will be donating a portion of the festival’s vendor fees and donation collections for hurricane victims in Vieques, Puerto Rico. For more information about the Heart of Cary Association or the Harvest Festival, visit www.heartofcary.org. Heavy pedestrian traffic is also expected on both days. Drivers are encouraged to use caution in the area. To receive notice of traffic implications related to this and other events, go to www.townofcary.org/email and subscribe to the News, Events, and Alerts list. For real-time traffic updates, visit “Alerts and Closures” at www.townofcary.org, follow the Town of Cary on Twitter @TOC_Traffic and navigate via the Waze app on your smartphone.